Happy happy boing boing. Let me well understand the format today. This is raga rock, not ragna rock? Allrighty, i just decided i need a shredding Chipmunk! Could Norwegian Wood have been an inspiration for the Norwegian parrot? The Real "Morning Joe!!!" Hello Tribe...! Good day, all! Here's wishing that it doesn't take long to get your sitar tuned up this morning. G'TZAG Joe and all! Now I'll be spending all morning trying to figure out the best way to play air sitar. Hi all, good Monday. 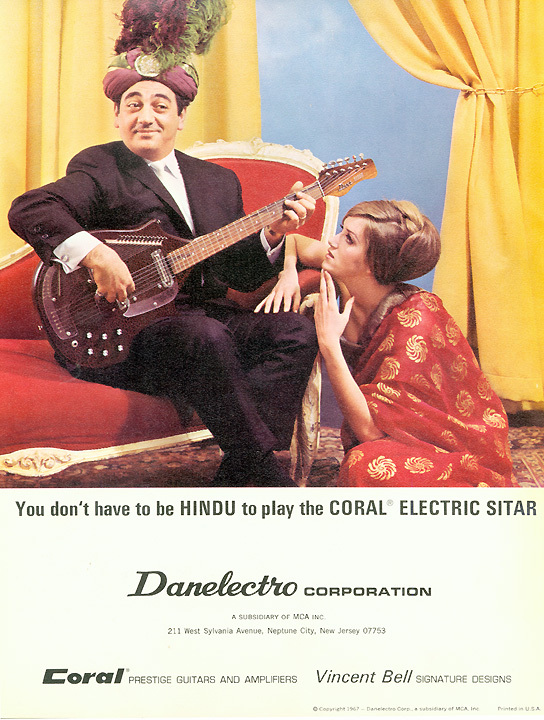 Easy Listening Sitar, what a concept! @bob: Thanks for asking, Bob! A little bit, but this plague is hanging on! Hahaha , I just commented this piece on Avant Ghetto. You know Jimmy Page stole this. It is Davy Graham's adaption of the tarditional "She Moves Through the Fair" from 1963. Jimmy Page claims the composing credit. @Guido: Ha ha! He stole from everybody! I always wondered about who played the soprano sax on White Summer, anyone know? I lent a Sitar Rock cover record to Ken once. It may have been a casualty of the Hurricane Sandy Basement flood. Morning Joe! Morning fellow listeners! John Fahey on "dance of death" album 1963 made dobro guitars sound like sitars. Jim Sullivan (Lord Sitar) is said to have taught sitar to George Harrison. Sullivan did exploit but he truly was an innovator in this regard. damn straight Guido. i want a Dave Pike Set LP *now*. @ Joe: any Strawbs or Velvet Opera on the playlist this morn? Hud played a mean sitar...probably still does. As a first call London session musician, it seems likely that Sullivan was recording sitar parts for various purposes before they were appearing on pop records. @VP: Possibly, I have one Elmer Gantry track floating around....let's see how the tabla falls! Great show thanks Joe. More acid Brits please - Traffic's "Paper Sun"
@tadpoles: No worries! We will cross the pond again. @Utopiast: Glad you can be here with us. coincidences today , we had a version of "The Look of Love" on Frank's show. I would like to request The Higher State or Bronco Bullfrog so I can say I contributed to this show. I'll second "Paper Sun", and mention Kula Shakers' "Govinda"
Your ambition is paying off! This is a wonderful show so far! @Ear Hammer: Aw, thanks, EH! black butter lyric threw me off..
this stereo record is not mono-compatible! Vocals will disappear when played mono. It's a Bob Brainen time warp! Thanks, guys. Yes, if you haven't pledged yet, please help us out. It's our final week. Yes, very obviously wrongly connected wires. Beefheart's Magic Band jamming with Tangerine Dream? @Guido: Featuring "Ry Cooter" on guitar! whoh Ceylib People are destroying what is left of my mind. Fred, that was a cool place. I had a hell of a time finding it. Hey, there is a new Star Trek on the internet called Star Trek Continues....some TOS sets, new cast. Its awesome! ... hahaha ... i have this. with the instructions how to make a psychedelic party (without drugs). yeah, i'm pledged out too. please give. My third eye is weeping. will be the next exploito-record to follow in this set? the monsters from the Id! This piece is pretty idiosyncratic. Give Joe something to do! This guy's id needs some dark chocolate. @Jeff: I'm glad you didn't say idiotic. Good morning! So this is the original version of Love Buzz?! WFMU: Where the Shocking Blue "Love Buzz" gets way more airplay than the Nirvana one. shocking blue<3 this is great.. .
hey there uh...did I miss singles going steady? The opening section is the alap. 'Inner Light' is not actually Raga - but Tibetan I think. @RR63: Thanks for the info! @Bronwyn: I love Peter, but I think he may be a bit too folky for the raga rock. @LA: Hey, Alex! The House of the Rising Drone! Guten "Sitars Going Steady" @Joe McG! Loving every minute of the show this morning, I've always been a fan/student of the sitar/raga/rock thing, so I'm in Radio Heaven. Glad to hear it, P-90! holy carp. Don't think I ever heard this P Things tune. last night, just left of WFMU on the dial, they were playing all LIVE Ravi Shankar. Found it on the way to looking for FMU and missed much of Faye's show because of it, but it was great music to zone out on my cooking project to. @Mike: That was probably KCR. They do some fine Indian programming over there. Another coincidence: Had a look at Facebook and an old friend posted a picture of his sitar teacher. I remember the day he bought his first sitar about 40 years ago..
great show, JM! Thanks! Gotta switch to the app as I run around! Yeah, I think so, Joe...that's Columbia U, right? I stopped on it cuz it sounded like it could be FMU and it was a while before the DJ came on to back announce. @Mike: Yes, I used to listen quite often to their Sunday night Indian classical show. Thanks for reminding me! although this sounds pretty much like My White Bicycle. is it too early to eat a bag of jalapeño chips? KNEW it was only a matter of time until Steve Howe came into this! All roads eventually lead back to Steve Howe. Hey Joe, still adjusting to this Monday malarkey. @Brian: Me, too! We'll get there. nice @Joe! Will definitely remember that one. I usually head to BAI for olde timey radio at that time, but I wasn't into what they were playing last night. Its so great to have so many options, without even needing the internet! All this sitar is making me feel like I'm dining in one of those Indian restaurants on E. 6th street in the East Village (on drugs). "For Fox Sake" - brilliant. Joe, the sun is shinging outside, got me thinking of so many Sixties sounds. Original Nirvana, Dantalions Chariot. All the R'n B groups grew their hair and started wearing kaftans. Brian, I can't believe you just named the group I have cued up. pretty much all country music and political talk down there, right, DC? not country. Use to have bluegrass but they replaced that with more talk. Every once in a while you can find some interesting Latin music or go go but usually not. If memory serves I bought Heartful of Soul and You've Lost That Lovin' Feeling on the same day. Early '65? What a great year, the music changed its shape and the LP became credible. This show will lack for CanCon if there's no Poppy Family. You do want Canadians to like your show, don't you, Joe? One or two overnights a week on one station there's good freeform jazz and experimental music on, but otherwise DC is a wasteland. @Gaylord: I have the first Poppy LP with me. Should I hit "Free from the City"? Joe, will there be a 'phasing' set? Did you folks call it that? @ Brian: Good call on Dantalian's Chariot, not a band we heard much here. And your comment about English R&B groups suddenly wearing kaftans and growing their hair sums up a huge chapter of rock evolution at a particular point. WAMU used to have a great bluegrass/folk afternoon thing. I was hoping to hear a bit of C&J. Thanks for a fab show Joe! @Joe McG: Yes, please! And thank you! Within You, Without You. Still stands the test of time, not much else on Sgt Pepper is up there. Took me years to realise the qualities of Revolver over Pepper..
Any Move in the remaining mix, Joe? Love the Poppy Family … but I forget why. @MattBelow will have a listen after the show. Thanks. for fox sake! i like it! wikipedia says Dantalian's Chariot, a not o?? @Listener Alexandra: I hope I havent used up Joe's Poppy Family quota with my suggestion. There's been talk about a Tomorrow reunion in the works for a few years, btw. They're all on board, just have to work out the details. I have a feeling they'll stick to the UK, though. @? : Yeah, sorry, spelled it wrong. I'll fix it! Joe, can you fix my spelling too, and make me handsome and have a good singing voice. Wow, thanks, guys, for making me reach my goal today! How exciting!! Oh well one out of three is a start. @Alex: I don't mind! I wouldn't mind playing them every week! I'll get "Blood in Bone" on for you soon! Joe, you rock my world. When the white eagle of the North is overhead. Put up the umbrella. Ah oh wise moody blues narrator guy. !!!!!!!!!! Goals met! B-E-A-U-T-I-F-U-L show today. Oi Joe haven't heard this Moodies in ages. Used to blow my mind. Ps sent a check to FMU by mail and requested your mix. Great show thanks. I can't tell you how many afternoons my mates and I spaced out to Moody Blues in hot humid Maryland in in 1972. I literally can't tell you. that is how much fun THAT was. OK, going to have to find an Indian food truck now..
Amazing show and music...thank you! dcp, weird,the trucks never come to my neighborhood, but the Indian truck is coming by today. This has been a consistently great episode of Surface Noise. Archive gold, for certain. This show has definitely informed my lunch snd dinner venue decisions. Thanks for listening, everybody, and stay tuned for Three Chord Monte with Joe Belock. Special guest: Sweet Talk! Thanks Joe and CU next week same board! @Chris B and Joe McG: I was just thinking I'll be referring friends to this archive when this topic comes up in conversations to come. Thanks, Joe! Perfect way to segue back into real life.